LOUISVILLE, KY. – From bag targets to foam blocks to big deer to several unique bull’s eye targets, there is no shortage of new target options for bowhunters to consider this year. Elk hunting a bugling bull is one of the best ways to spend a September day in the western high country. But getting ready for a bowhunt for wapiti isn’t always easy, at least where having cumbersome and expensive elk 3D targets are concerned. 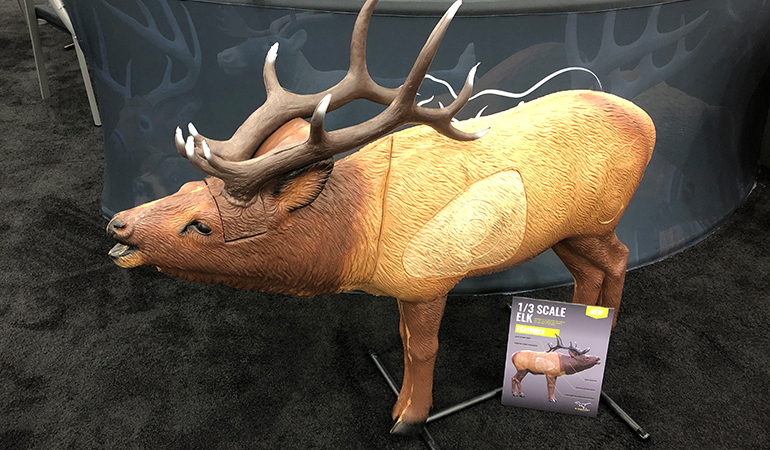 The folks at Rinehart have solved that dilemma thanks to the company’s unique 1/3 Scale Woodland Elk 3D target, an anatomically correct elk target that stands only 33 inches tall and 44 inches long. Weatherproof and UV resistant, the 1/3 sized elk target is made from the company’s FX Woodland Foam and features the ability to replace the vital area after numerous shots from compounds and crossbows. Small on size, big on realistic target features, the new scaled down Rinehart elk target is perfect for the backyard shooter needing an elk target that is easy to move and store. 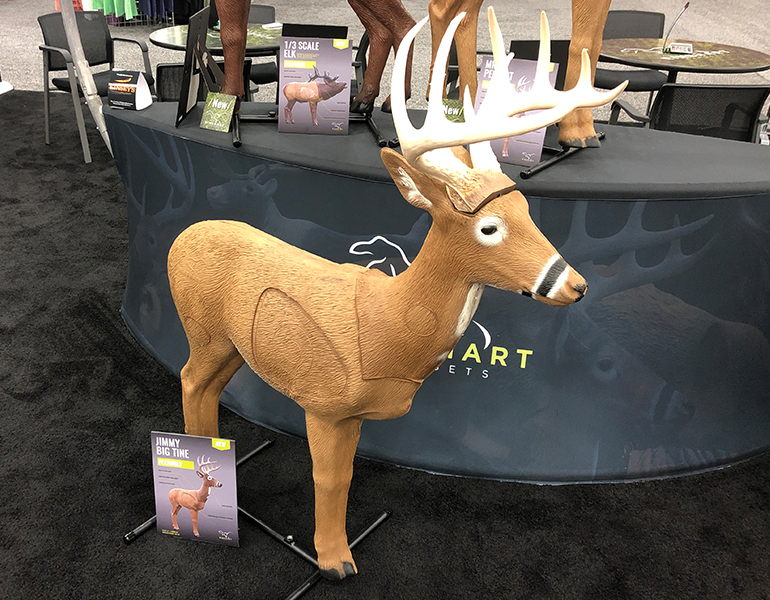 Like the other 3D deer target options from Rinehart, the new Jimmy Big Tine offers a realistic target that is easy to store and move in addition to withstanding thousands of shots from a compound bow or crossbow. Utilizing the company’s FX Woodland Foam construction, this UV and weather resistant target measures 48 inches tall and 40 inches long. With a record book rack that locks in on top of the target, there’s no better way to prepare for deer season than using Rinehart’s new Jimmy Big Tine! One of the more common frustrations that bowhunters have as they practice in the backyard is what to do with a bag target. Do you invest in a large and cumbersome stand to hang the target from? Do you lean the target up against something and risk an arrow getting damaged if it extends through the back of the target? Or do you put the target on the ground and hope it doesn’t fall over? 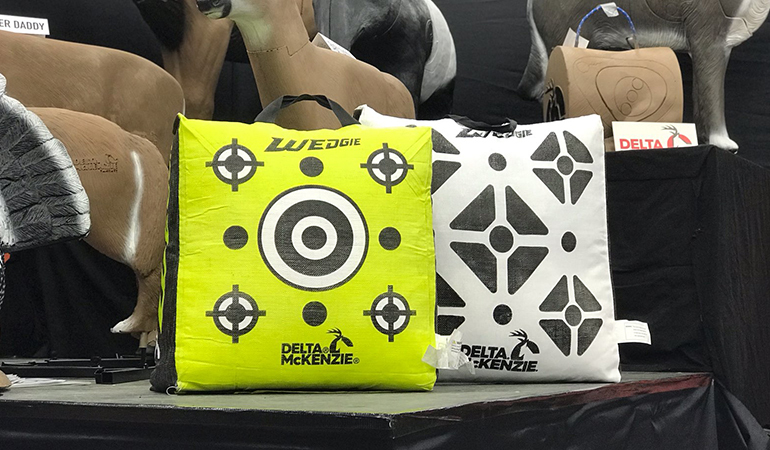 Those problems are resolved now thanks to the new Wedgie Bag Target from Delta McKenzie. With traditional graphics on one side and a unique sight-in scale on the other, this target’s unique wedgie shape allows it to take shots all day long from high speed bows and crossbows. Weighing 19-pounds, the target is several inches wider at the base, a allowing it to stand upright no matter how many shots an afternoon session produces. But it’s also small enough to easily throw into the back of a pickup as a hunter heads to deer camp too! 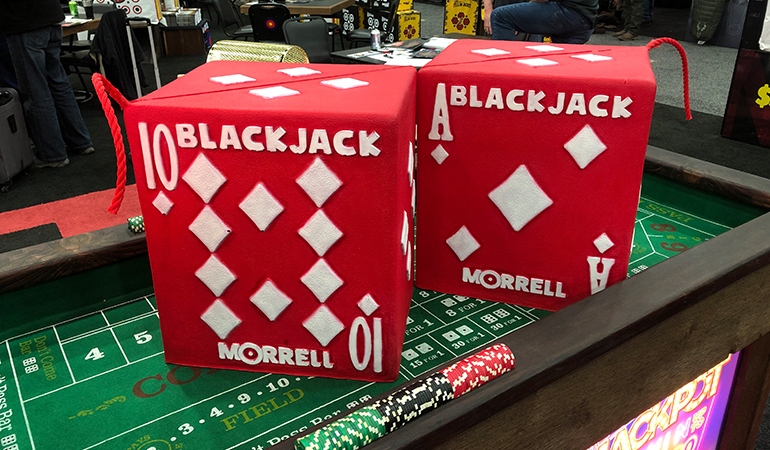 Utilizing Morrell’s multi-layer and offset bull’s eye technology, the solid foam and self-healing Blackjack target measures 16X13x18 inches and weighs 18-pounds. With 28 shooting bull’s eyes, fade resistant colors, an EZ Tote carrying handle, and being 100-percent weatherproof, this target can take countless shots of arrows flying at up to 450 feet per second from both compounds and crossbows. And since it’s both fieldpoint and broadhead compatible, the Blackjack target can provide a winning hand whether you’re seeking an afternoon of backyard target shooting fun or getting ready to hunt the big antlered buck of a lifetime. If you’re looking for a fun and interesting way to practice archery shots this next year, why not head to the backyard casino? 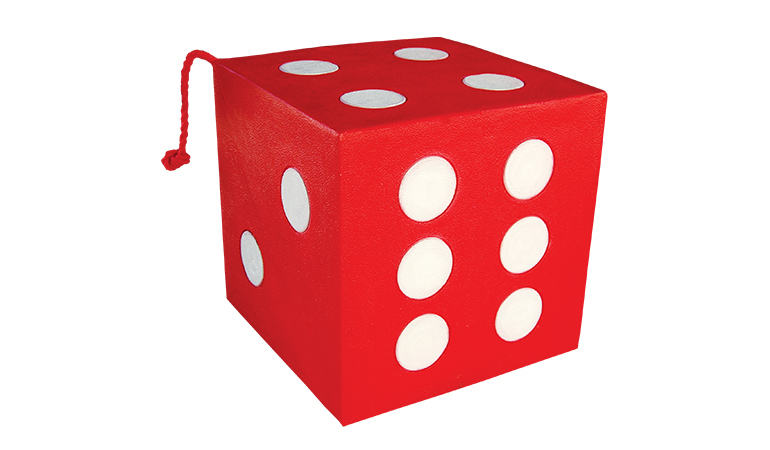 Or more accurately, why not spice up your practice sessions with the 13x13x13 Morrel High Roller 21 dice style target? Featuring six sides and 21 circular bull’s eye patterns, this target stands up to repeated shots of arrows fired from compounds and crossbows at arrow speeds of up to 450 feet per second. Fade resistant and weatherproof, this 10-pound target is usable with both fieldpoints and broadheads, providing hours of backyard fun or a quick and fun sight-in session at hunting camp. Arlington, Texas based company uses Bonded Core Technology to provide a top end bag target that stands up on its own along with ample endurance to handle countless shots from either compound bows or crossbows using field points. 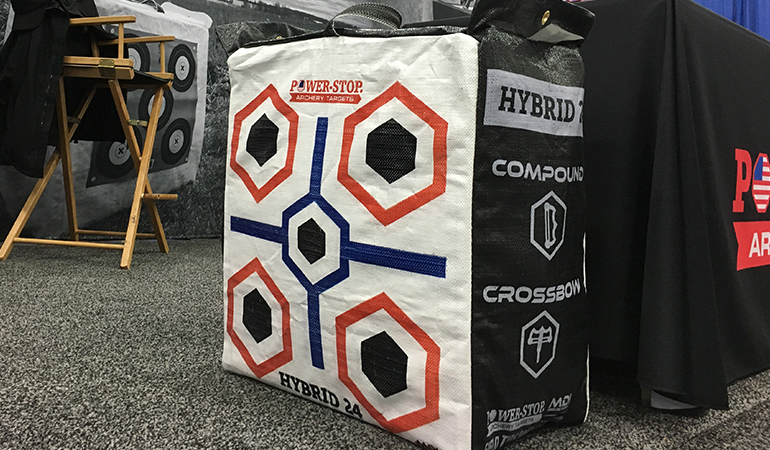 With either a printed flat target front or a plain flat front (that allows for the pinning of different target faces), these Power-Stop Hybrid Bag Targets can be used individually or stacked in groups of four to create a backyard archery range or 3D target backstop.